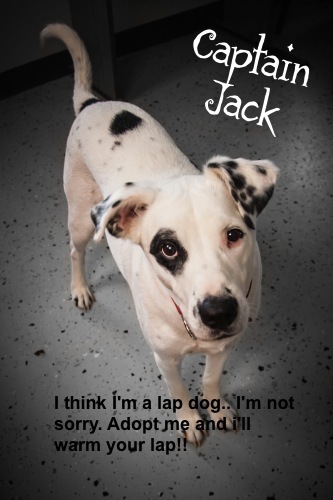 Captain Jack is special needs because he is deaf. He is currently with Fayette Friends of Animals in Uniontown, PA. He does understand sign language. Captain Jack gets along with other dogs. He doesn’t like for another dog to sneak up behind him though. Captain is about 3 years old and a medium sized dog. Posted November 30th, 2012 . If I lived anywhere near Pennsylvania I would have to claim him! Gorgeous boy. And who doesn’t love an oversized lap dog? Captain Jack is one of the most wonderful dogs that I have ever come across! Any time I’ve been at the shelter, he is right by my side looking at me with those hopeful eyes saying, “Please pick me! I promise I’ll love you forever!” If only I were allowed to have more puppies at home! I met Captain Jack last week at the shelter. He was so sweet and was good with my kids, ages 12 and 9. He was in the office with another dog and was fine with her. He would be worth the drive to western pa to come and meet him!!! He’s ADORABLE! I bet my miss Kyna would love him. Hmmmm I see a trip to PA maybe!